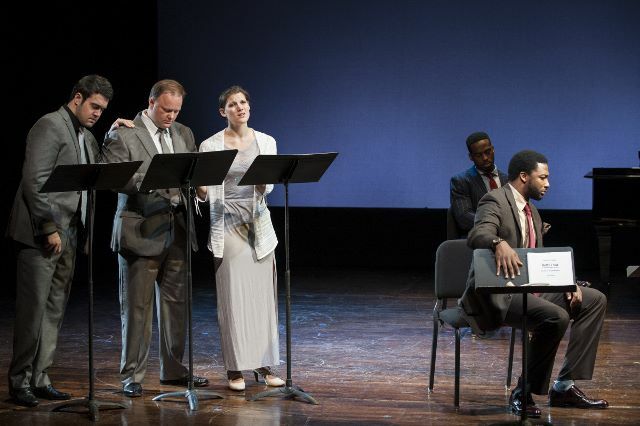 The second season of Washington National Opera's American Opera Initiative opened on November 13 with a trio of eclectic short operas at the Kennedy Center's Terrace Theater. Accompanied by an eight-piece chamber orchestra, conducted by Anne Manson, the twenty-minute works were musically edgy and dramatically compelling. Each received an enthusiastic reception from the SRO crowd, many of whom remained for a spirited post-performance session with the artists. Soloman Howard, and Norman Garrett (front) in Duffy's Cut. Based on a real U.S. incident, the title refers to the Pennsylvania work camp where 57 Irish immigrants, hired as railroad workers, tried to flee a cholera outbreak in 1832 and died en route to safety. (Or were they killed by local farmers?) In the opera, three ghosts (tenors Patrick O'Halloran and Tim Augustin, and soprano Shantelle Przybylo, whose voice seemed angelically pure) return to haunt the camp blacksmith, Malachi Harris (Norman Garrett), who's been ordered by railroad contractor, Philip Duffy (Soloman Howard), to cover up the tragedy. Who lies in this befouled land, what happened long ago. The music by Jennifer Bellor was a contemporary pastiche, using contrasting rhythms and clever harmonies and even hints of calypso to intriguing effect. Norman Garrett's elegant basso cantante and crisp diction were the opera's conscience, and he was admirably aided by Soloman Howard, whose dark, resonant bass was also employed to fine advantage in last year's WNO Show Boat and this October's Force of Destiny. I was moved by the opera's elegiac tone, and though it was slightly hard to follow, it was my favorite of the three. The plot of this mini-opera could come from the headlines. When Johanna (Deborah Nansteel), a TV news reporter, arrives first at the scene of a hostage crisis, she's eager to get the story and make a name for herself until she meets the sister of a victim and encounters the real face of human tragedy. Composer Gilbertson relied on the intensity of the strings to create irony, heat, and tension, while librettist Caroline V. McGraw ably dramatized the protagonist's transformation from eager journalist to shattered witness. Deborah Nansteel, who impressed me in the small role of Curra in WNO's recent Force of Destiny, was a vocal powerhouse as Johanna. Her rich full-throated mezzo pulled the audience into Johanna's ambition and her gradual epiphany. Bass Wei Wu's witty presence as Sam, the producer, soprano Jacqueline Echols's controlled sorrow as Zoe, the victim's sister, and tenor Patrick O'Halloran's warmth as Johanna's husband, contributed to this work's many mood shifts. At one point Sam sings: We'll be first on the scene if we rush...Something for you to wrap your voice around. Mr. Gilbertson and Ms. McGraw gave their singers plush vocal lines, creating strong solos and effective ensembles. In some ways Uncle Alex was the most dramatic of the mini-operas because the stakes in this opera are immediate and riveting: will a pregnant mother and her teenage son who've suffered horrible losses on their voyage to the U.S. (circa 1907) be allowed to enter America or be sent back home to Russia? Their fate rests in the hands of Inspector Matthews, sung with increasing power and pathos by tenor Tim Augustin. The duo's prospects are eventually changed forever by the courage of a stranger, Alex Margolis, played by baritone Christian Bowers who sang with luster. Early on the music brought to mind Menotti's Amahl and the Night Visitors in the tender byplay between the mother Anna Engold (Deborah Nansteel) and her son Jacob, winsomely sung by tenor Yuri Gorodetski. Bornfield's score grew more atonal and complex as the conflict progressed, and Inspector Matthews told Anna she needed a male relative to vouch for her. Ms. Vincent's libretto was a luminous standout here as "Uncle Alex" lies about his relationship to the Engolds. It dawns on Inspector Matthews that most Americans came from somewhere else, even his own dear grandmother: She came from Ireland. Nanna...All for a better life. For streets paved with gold. Ms. Nansteel again sang with poignancy---her pianissimo was stunning--and Mr. Augustin's change of heart was touching and persuasive. It's premature to guess whether the composers and librettists on display this week at WNO will join the ranks of the finest composers writing in English, but talent and versatility were there in abundance. As Ms. Zambello and the company continue their emphasis on new opera, I look forward to WNO's holiday opera premiere, The Lion, The Unicorn, and Me, with music by Jeanine Tesori and a libretto by J.D. McClatchy (December 14-22), and a new hour-long work, An American Soldier, by composer Huang Ruo and librettist David Henry Hwang, which will have its world premiere on June 13-14, 2014.